John Bett hails from Mogoiywet Village, of the Rift Valley Province of Kenya. His few grey hairs and almost bald head speaks to his age but, his energy surprises a lot of people. He is seventy-one years old and a true testimony to the saying that ‘age is just a number’. John has been serving in the church since his early twenties and vows to continue doing so until his last breath. He is a former teacher and is a committed family man who boasts about his wife and ten children of which five are girls and five are boys. “How do you provide for your family?” I ask. “I do dairy farming and maize farming and that is where I get my daily bread from,” he says. Apart from staying at his farm and taking care of his crops and animals, he is also a church elder at Christ the King Mogoiywet Church. Come Sundays, he is among the first people to get to the church to make sure all is set before the church service begins. He prides himself on the fact that he was among the people who laid the foundation of the church they worship in now. “It’s a semi-permanent structure but our prayers still reach to the heavens”, he jokingly says. 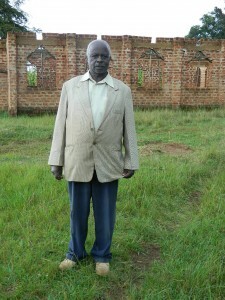 “We had started to build a permanent church but since water is not readily available we had to put it on hold”, he adds. John believes that things will only get better if a reliable water source is put on the church property. Not only will the sanitation and hygiene improve, but water bourne diseases will be controlled as well. He also says that the feeding program in school could be permanent and a boarding school could also be started. “Church rallies and camps will also be organized once we have enough water available and we could also finish up our permanent church”, he says. He concludes by saying that with the availability of water the church will start planting vegetables so as to enhance the feeding program of the school and that the water will be a unifying factor for the entire Mogoiywet community. 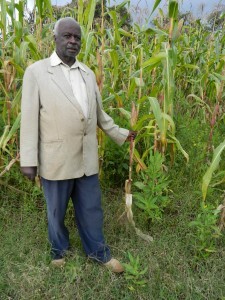 When you invest in The Water Project, you're investing in people like John Bett. Your gifts help us reach more communities with the gift of clean, safe water. And every drop helps unlock potential.